Above Image: I use the Large Ruled Notebook by Moleskine. I’ve got a pretty intense schedule, in the past I’ve written about the many tasks of an analyst in the day job, and I also spend time being in the conversation by maintaining this blog, being active on twitter, maintaining communities in Facebook, and attend many events. I’ve got a personal life, spend time at the gym, am a husband, and have a social circle that’s not even connected to the tech world. Technology isn’t always the answer to everything, in fact I actually don’t use a digital device as they take too long to input, aren’t always available, are fragile, and there are risks of battery life limitations and data loss, so I use paper. I use a Moleskine, the medium size in fact, but any book will do. I use two pages each week (or more often) to organize my tasks. For every task, I create a small checkbox, for items that are urgent, Ill mark with an “!” mark. As I complete tasks, I’ll check them off. 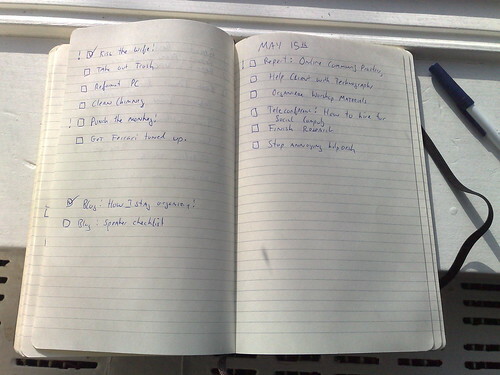 Just about every week I’ll recreate the list, reprioritize, and consolidate. I find that writing the tasks down actually helps with me subconsciously brainstorming, and reviewing you go to bed at night is a great way to put your internal employee (your unconscious mind) to work. This is why you’ll often notice my blog posts come in the early morning, I sort my problems at night. On the top left column, I list out all of my personal tasks to take care of, house, car, bills, important dates, medical issues that need to be dealt with. On the lower left I list out blog ideas, (you never know when you’ll get them) it’s important I write these down, as sometimes I’ll forget, and that’s very frustrating. Both of these rarely exceed the whole page. Now on the right hand column, this is dedicated to my work requirements, and it quickly fills up the half of the page in no time. When I see more than 10 tasks, I know it’s time to start to really focus by prioritizing, turning off distractions, and hunkering down to get my work down. This process has been working well for me, although I’m not a star analyst, I’m meeting the requirements of a new analyst, and so far, I’ve not dropped too many personal tasks. I’d love to hear from you, how do you keep organized?